Dear Heavenly Father, how will they know if we do not speak. How will they know unless we raise our voices. You were sent to heal the brokenhearted, to speak and shout about liberty to the captives, and open the prison for those who have been bound. Oh Lord, may we find our courage to speak boldly and proclaim your truth for the healing of the broken and deliverance of the captives. Father, heal your beloved and set your people free. In Jesus’ Name. Amen. Lisa Davis is the Deeper Still Chapter Leader of Northern Indiana. Lisa resides in Fort Wayne, Indiana with her husband Mike of thirty-three year. 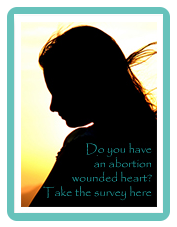 She has been working in post-abortion healing ministry for over twenty years. Thank you Lisa for sharing a part of your story today and proclaiming the good news to the captives. The truth can only come about when we use our freed voices and share the hope and healing found in Jesus Christ, our Lord. I’m sure you heard the news. New York legalized abortion up to birth. However, New York is not the first. According to The Guttmacher Institute, seven other states and the District of Columbia already allow for abortion up to birth. These legislators are not hiding behind some idea that the unborn baby is not human. Rather, they place the decision of the mother before the rights of the baby. They are essentially saying that women need, and in fact, want abortion. They believe abortion is good for women. How is it they have come to believe this? I will tell you that after twenty years of working in the ministry to women who have had abortions, the vast majority of them would rather never breathe a word about their abortions to others. It is only after various combinations of depression, anxiety, shame, guilt, substance abuse, eating disorders, relationship problems, parenting problems, or signs of PTSD that some of them come to the point of desperation for healing. Sometimes this complicated grief takes years, even decades to process and is often attributed to other things. As an R.N., when I worked on a psychiatric unit, we asked our patients if they had any losses- jobs, relationships, people, pets. We never asked them if they lost a baby to abortion. Abortion is a loss that is self-induced and highly suppressed. However, no amount of denying the humanity of the unborn and elevating the rights of the mother can hide the truth that there is indeed a child lost. But there is hope for healing. God pours out healing in many ways. The Gospel of Jesus Christ is enough to bring healing through the forgiveness of sins. But still, many women fear judgement from others and keep their abortion secret. Many women (and men) don’t completely embrace God’s forgiveness and still walk in condemnation. How will legislators ever know the truth about how abortion effects women if the only voices they hear are those that “shout their abortion”? I believe the women who shout their abortion have denied the reality that abortion took the life of their baby. I know because I used to be in denial. It was only after years of infertility and the daily example of my two living children-direct siblings of our first baby, lost to abortion- that brought about a keen awareness of my terrible choice. My abortion was in 1983 with my now husband. We were not married at that time and at that time, his response was permissive. After 33 years of marriage, we are finally walking in the freedom and calling that God has on our lives. Together, we now facilitate Deeper Still Retreats- where a large measure of our healing took place. We went to separate retreats for focus, but I was able to be at his retreat as a team member to minister to the women there. Most of the pictures with this post are from his retreat. Oh how God poured out His tender mercies there! Don’t let another day go by without receiving all that God has intended for you. His plans are to prosper you, not to harm you. He wants to bring you a hope and a future. (Jeremiah 29:11). The president and founder of Deeper Still, Karen Ellison, has a book coming out very soon, Healing the Hurt that Won’t Heal, Freedom for the Abortion-Wounded and Help for the Church They Fear. It will be available on Amazon soon. There is an awakening happening in our country and a hunger being stirred for those with abortion-wounds to find help and healing. Our hearts break for those like Lisa mentioned who are in need of healing. Jesus came to bind the brokenhearted and to set the captives free. There is hope and there is help. Go to www.GoDeeperStill.org to find out more about our retreats and where one is near you. Our retreats are free of charge. Lisa God’s blessings as you reach hurting women and men🙌 Thank you for sharing your heart. Praying for your Deeper Still chapter. If it’s God’s will we will have one in North Alabama someday.